We live in an area in Canada where it is very cloudy in the winter months. Sometimes we can go weeks without ever seeing the sun. When the sun does eventually come out, the feeling of exhilaration is almost indescribable. The gloomy feeling of gray skies day after day can really take its toll on a person's emotional well being. Today's promise is taken from the priestly blessing in Numbers 6 that the Lord told Moses to pray over Israel on a daily basis. 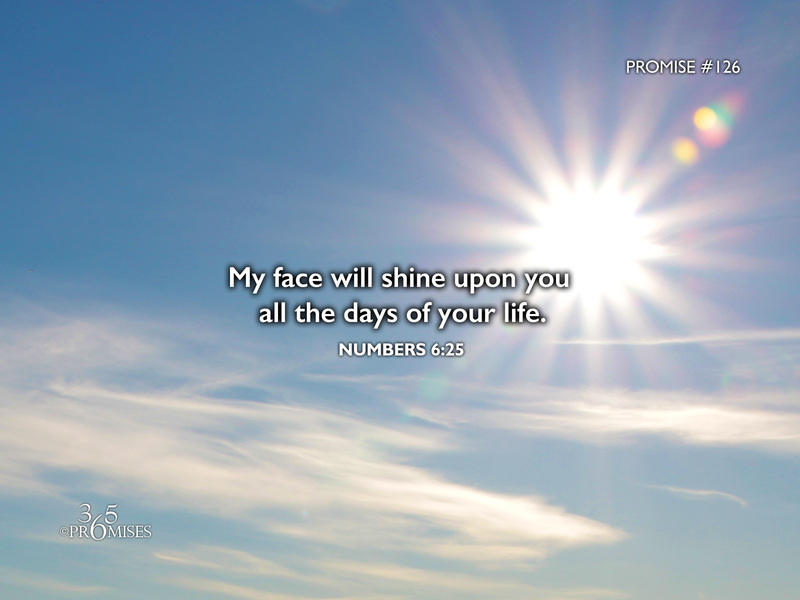 In this blessing from the Lord, Moses tells the people that the face of the Lord will shine upon them all the days of their life. Can you imagine living every day of your life being aware of the brightness and warmth of our God and Father's countenance? Even though clouds do come our way, we can rise above the clouds (just like we can in an airplane) and still see His face shining on us. My prayer today is that each and every one of us would feel the warmth of His love and the brightness of His face shining upon us. We are not called to walk this life alone. Our Father is watching over us every step of the way.